Washington, DC attracts thousands of college students and interns every year. The college years are ripe for spiritual growth and we welcome all who wish to join us at our church. Our primary ministry to students is twofold: the public teaching of God’s Word in which the good news of Jesus Christ is proclaimed, and the relationships in our community of believers that gather to be built up by that Word. 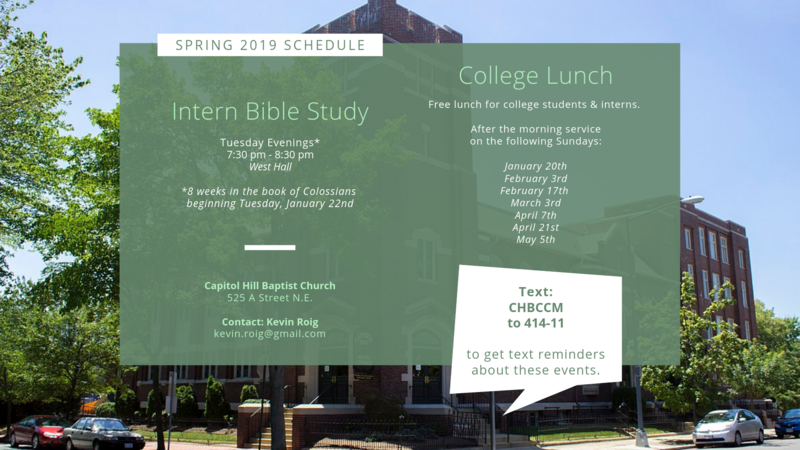 College/Intern Lunch: A free meal and Q&A with a pastor, immediately following the 10:30am service on the 1st and 3rd Sunday of each month during the fall and spring semesters. Intern Bible Study: Meets on Tuesday nights at 7:30pm during the fall, spring, and summer semesters. All interns & students are welcome. Please e-mail Kevin Roig for more information. One-on-One Discipling: We encourage students and interns to meet regularly with a member of the church to study the Bible and grow in understanding the good news of Jesus. If you’d like to find someone to meet with you, simply contact the appropriate name below. Campus Outreach: A campus ministry of CHBC, Campus Outreach equips and mobilizes students for discipling and evangelism on campus at Georgetown University, Howard University, and The George Washington University.